They say that the camera never lies. I know that this is not quite true. Being married to a professional photographer has its advantages and disadvantages. I've always hated having my picture taken because having been fat enough to rival Jabba the Hut in my teenage years, you don't want to be reminded which bits bulge that should bulge. And even when I'm at my slimmest, I'm still not happy with my body - in fact when I was at my running peak (and I still weighed 10st something at this point) I thought I looked skeletal and gaunt - let's face it, women are never happy. When the hubby opened his studio, I was still in my post pregnant haze and so really not wanting to be in front of the camera at any cost. I remember coming home from walking the dogs one morning to find him unpacking new lighting equipment in the lounge. "Just sit there and let me test this" says he. After a lot of protesting about being mud spattered and fat and ugly, I gave in. A few hours later, he presented me with the results of the picture. I was really chuffed. I was looking quite good for someone still three stones over her ideal weight and who'd suffered many a sleepless night. Stupidly, I made this comment out loud. "Well I slimmed down your face, rubbed out your wrinkles, edited out the bags under your eyes, whitened your teeth and eyes...." At that point, I walked away to have a little sob to myself. Still at least when Abigail looks back at some of the pictures of her mum when she was young, she'll think her mum was a bit pretty. In reality, I don't quite look much like my blog or Twitter pictures. Unless I'm in flattering light. I'm too old for that. And unflattering camera light brings me nicely round to today's recipe. 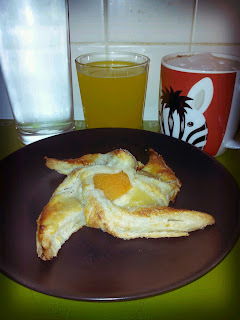 When I took the pictures of the apricot Danish, I couldn't quite find the right angle to photograph it from. And when I did take the picture, the harsh light from the flash (it's just to miserable to get any good light in my kitchen this morning) showed up the need to grout between the tiles in my kitchen. Ooops! And I'm rubbish at Photoshop so I can't even edit them to make it look better. I picked today's recipe because I had a little bit of left over pastry in my fridge from making sausage rolls. It's from Lorraine Pascale's Home Cooking Made Easy which the husband bought me for Christmas. I blogged early on about trying to make cherry Danish with puff pastry. That recipe used some weird Philly-based cheese filling which was okay, but not really what I'd consider Danish filling. My attempt at making actual Danish pastry the other day was a bit of a long-winded failure so Pascale's recipe seemed a good opportunity for another attempt to make something I could make time and again. Simple and tasty without hours of labour. The original recipe uses shop-bought fresh custard as the filling. But as I didn't have any to hand and didn't want to buy a whole pot to just make two Danish (that's all the pastry I had), I thought I'd have a go at making proper creme patissiere instead. It's something I've made once before when I was about ten, under the eagle-eyed instruction of my mother, the ex-pastry chef. I think we made a strawberry flan. But I'd have no idea how to make the pastry cream off the top of my head. So I turned to t'Internet. I know the Great British Bake Off book has a recipe for this, but I was too lazy to get the book off the book shelf at stupid o'clock in the morning. Instead, I used a recipe from Joy of Baking. As I was only making two pastries, I made one third of the recipe which was probably enough to make four apricot Danish. I also put the custard under the apricots, rather than on top of them as Pascale suggested. The pastry points wouldn't stay together on top of the apricots so I used a little blob of pastry from the trimmings to stick them all together and this survived the oven. For a simple, non-faffy Danish recipe, this worked really well and I'd definitely make them again when I had guests. I'd still love to master making the actual pastry myself, but it wouldn't be something I'd do every time as these are just as tasty as shop-bought and if I'm honest, most people (ie the husband) wouldn't appreciate the hours you spend labouring over home-made pastry if they taste just as good with shop-bought. First, make the creme patissiere. 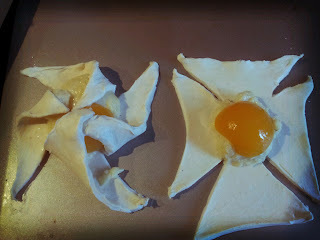 Mix the egg yolks and sugar in a heatproof bowl then stir in the flour and corn flour to form a thick paste. Heat the milk and vanilla pod (if using) in a medium saucepan until scalding. Carefully remove the vanilla pod (if using) and scrape the seeds into the milk (this can be rinsed and added to a jar of sugar to make vanilla sugar). Pour the hot milk into the egg paste and whisk quickly to combine. 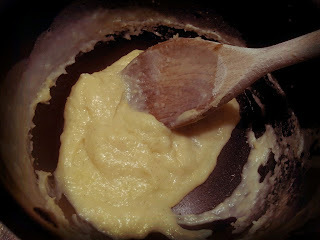 Return the egg mixture to the saucepan and bring to the boil whisking constantly. Once boiling, whisk for a further 45 seconds then remove from the heat and leave to cool. If using vanilla extract or bean paste, stir this in now. Roll the pastry out on a lightly floured work surface to a 30cmx30cm square. Put a spoon of pastry cream into the centre and then top with an apricot half. Fold alternate corners of each cut section to the centre, brushing the tips with beaten egg. Refrigerate for 15 minutes or so until firm. Remove from the fridge, brush with egg wash and then sprinkle with sugar. Bake for 20-25 minutes or until firm, risen and golden brown.